Sarah Pye creates large impressionist paintings, freely and intuitively. There are never preliminary sketches or plans, only a blank canvas, lots of paint and the excitement of an idea fired by an exquisite view or image. With nature’s colour, light and life always foremost in her mind, she drops, dribbles and splashes acrylics with impressionist expression. Many layers go onto each individual piece, working on two or three paintings at a time, due to the necessary drying periods between each layer. Her work evolves naturally and some pieces will be almost pointillist in appearance when complete. 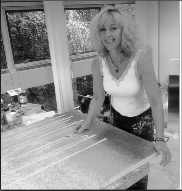 Painting professionally for the last decade, her studio is just outside Henley and being surrounded by rural idles, she will never be short of ideas and inspiration. These works of art are collected across the country and abroad. She exhibits specific collections at various national events throughout the year and has permanent displays in the Marylebone Gallery in London, By Gillian Gallery in Bourne End, Buckinghamshire and The Joanne Harmer Gallery in Deal, Kent. Annual solo shows and a permanent display can also be found at The Frame gallery in Odiham, Hampshire. Click this link to watch a brief film showing Sarah at work.